In the midst of the serialisation of his mid-period neglected classic, Martin Chuzzlewhit, Charles Dickens’s A Christmas Carol was published. A commercial and critical success at Christmas time 1843, its tale of redemption and compassion is arguably the Dickens book that resonates most today. 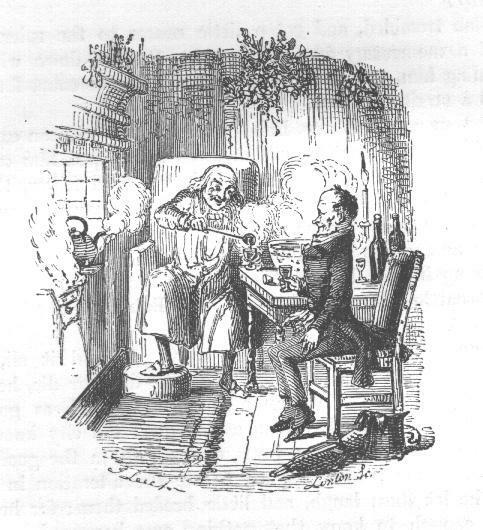 At the close of the novella when Scrooge’s transformation is complete, he tells his clerk Bob Cratchit, “I'll raise your salary, and endeavour to assist your struggling family, and we will discuss our affairs this very afternoon, over a Christmas bowl of smoking bishop!" *Bake the oranges at 180°C for half an hour until they are pale brown. *Prick five cloves into each baked orange and place in a warm mixing bowl. *Pour in the wine, sugar and spices; cover and leave the bowl in a warm place for 24 hours. *Cut the oranges in half, squeeze them into the wine and sieve it into a saucepan. *Add the port to the saucepan and gently heat without boiling. *Keep it on the stove all day for 15 – 20 warming cups of smoking bishop. On Christmas Eve, our house will be full of light and laughter. Friends will be welcomed, children excited and adults relaxed - everyone will live close enough to walk home. Offerings will be shared: spicy sausage, mincemeat, sloe gin; and aromatic and flavoursome smoking bishop.